Platinum-based doublets are an established standard of care for the first-line treatment of advanced non-small-cell lung cancer (NSCLC) patients. However, a plateau of effectiveness has been reached by chemotherapy during the last years. Notwithstanding, recent advances in the understanding of NSCLC biology have led to the clinical development of biological therapies specifically targeting the molecular mechanisms that sustain the growth and survival of cancer cells. 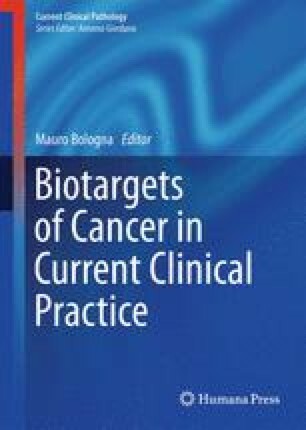 In some cases, such strategies have significantly improved the clinical outcome of advanced NSCLC when used as single agent either in the up-front management of epidermal growth factor receptor (EGFR)-mutated patients or pretreated patients unselected for EGFR mutational status, which is the case of the reversible EGFR-tyrosine kinase inhibitors gefitinib and erlotinib, respectively. In other cases, they have found a place-in-therapy in combination with platinum-based first-line chemotherapy, as for the monoclonal antibodies cetuximab and bevacizumab directed against the EGFR and vascular endothelial growth factor, respectively. Importantly, the recognition that certain clinical or biological characteristics may predict for increased sensitivity to a given targeted therapy has highlighted the importance of patient selection when designing clinical trials with these agents. This chapter is structured to summarize the targeted therapies currently in use for the treatment of patients with advanced NSCLC. In the second part, biological agents under clinical development are discussed.